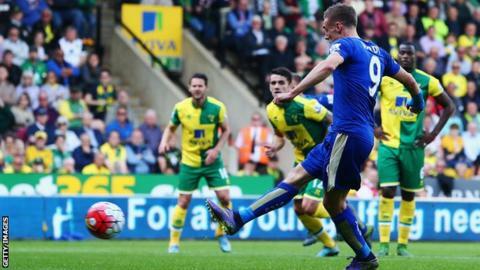 Leicester moved up to fourth in the Premier League with a narrow victory over Norwich at Carrow Road. The Canaries had most of the possession in the first half, but Leicester went ahead through striker Jamie Vardy's penalty after being brought down. Jeffrey Schlupp put the Foxes in control by slotting in a second, before Norwich's Dieumerci Mbokani scored. Nathan Redmond struck the post with a rising, angled drive in the closing minutes, but Leicester held on. Despite a late flurry, the hosts - who slip to 13th place - were unable to find an equaliser and prevent their first defeat in five games in all competitions. Claudio Ranieri bold decision to leave out Riyad Mahrez, one of Leicester's most influential players this term, met with murmurs of discontent before the game, but the Italian was rewarded for his bold move. The Algerian playmaker's mantle was assumed by Shinji Okazaki, who was a pest to the Norwich defence in tandem with Jamie Vardy. The Japanese forward - signed from German Bundesliga club Mainz in the summer - could not polish his fine performance with a goal, heading over a cross inside the opening seven minutes and skidding a low shot narrowly wide. But he was integral to a wonderful counter-attacking display from Leicester, who created a flurry of chances on the break. Vardy, Danny Drinkwater and Jeffrey Schlupp (twice) all spurned opportunities. It was a frustrating afternoon for Norwich, who enjoyed plenty of the ball and spent large swathes of the second half arrowing, looping and scuffing deliveries into the Leicester penalty area. For all that, though, they created precious few clear chances. The introduction of striker Mbokani on the hour did, however, offer a reference point for those attacks and eased the burden on the hitherto isolated Cameron Jerome. And the DR Congo striker's first goal for the club hauled the hosts back into the contest with 20 minutes remaining. Less than a minute after forcing a header against the crossbar, the 29-year-old - signed from Dinamo Kiev in August - was left unattended eight yards from goal to flick a deep cross past Kasper Schmeichel. A series of increasingly frantic attacks followed, with Sebastien Bassong just failing to connect with a Robbie Brady cross, Redmond hitting the outside of an upright and Christian Fuchs deflecting another Redmond effort wide, having earlier headed unwittingly over his own crossbar. At a Carrow Road stadium bathed in Indian summer sun, the home side fell to their second home defeat of the campaign - in front of a record attendance of 27,067 for an all-seater match. Norwich have now picked up maximum points in just one of their last six games, but have an opportunity to turn their form around when they face bottom side Newcastle at St James' Park in their next league game. Leicester bounced back from last weekend's heavy defeat against Arsenal and have now lost just once in their last 10 Premier League games dating back to last season. The face Southampton, away, after the international break. Leicester winger Jeffrey Schlupp: "Everyone has seen that we don't lack the fight and team spirit. We can dig deep when we need to. "We can adapt to any situation. Jamie Vardy up front terrorises the defenders. He is a pest and always in the defenders' faces." Leicester manager Claudio Ranieri: "We responded very well after our defeat against Arsenal. We showed good character and it was a good performance. "We have 15 points, 25 less than we need to. After we get that, we will see what happens." Norwich manager Alex Neil: "Today, for us in the way we played, it did not work. Our use of the ball was not good enough. "The lads will be disappointed and did not do themselves justice in the first half. In the second, they tried but it is difficult being two goals down." Match ends, Norwich City 1, Leicester City 2. Second Half ends, Norwich City 1, Leicester City 2. Offside, Norwich City. Jonny Howson tries a through ball, but Dieumerci Mbokani is caught offside. Corner, Norwich City. Conceded by Andy King. Corner, Norwich City. Conceded by Daniel Drinkwater. Attempt blocked. Nathan Redmond (Norwich City) right footed shot from the right side of the box is blocked. Assisted by Russell Martin. Attempt saved. Jamie Vardy (Leicester City) right footed shot from the centre of the box is saved in the bottom right corner. Assisted by Daniel Drinkwater. Corner, Norwich City. Conceded by Christian Fuchs. Attempt missed. Sebastien Bassong (Norwich City) header from the centre of the box is too high. Assisted by Wes Hoolahan. Attempt blocked. Jonny Howson (Norwich City) right footed shot from the right side of the box is blocked. Corner, Leicester City. Conceded by Sebastien Bassong. Attempt blocked. Jamie Vardy (Leicester City) left footed shot from the left side of the box is blocked. Assisted by Christian Fuchs. Attempt missed. Robert Huth (Leicester City) header from the centre of the box is just a bit too high. Assisted by Christian Fuchs with a cross following a corner. Corner, Leicester City. Conceded by Steven Whittaker. Attempt missed. Sebastien Bassong (Norwich City) header from the centre of the box misses to the left. Assisted by Robbie Brady with a cross following a corner. Corner, Norwich City. Conceded by Kasper Schmeichel. Attempt saved. Nathan Redmond (Norwich City) right footed shot from the right side of the box is saved in the top right corner. Assisted by Jonny Howson. Attempt missed. Jamie Vardy (Leicester City) right footed shot from the right side of the box misses to the left. Assisted by Marc Albrighton. Foul by Sebastien Bassong (Norwich City). Robert Huth (Leicester City) wins a free kick in the defensive half. Delay in match Jamie Vardy (Leicester City) because of an injury. Attempt blocked. Wes Hoolahan (Norwich City) left footed shot from outside the box is blocked. Assisted by Dieumerci Mbokani. Nathan Redmond (Norwich City) wins a free kick on the right wing. Substitution, Norwich City. Kyle Lafferty replaces Cameron Jerome. Substitution, Leicester City. Andy King replaces Jeffrey Schlupp. Attempt missed. Jeffrey Schlupp (Leicester City) right footed shot from outside the box misses to the right. Assisted by N'Golo Kanté. Attempt blocked. Wes Hoolahan (Norwich City) right footed shot from the right side of the box is blocked. Assisted by Nathan Redmond. Corner, Norwich City. Conceded by Robert Huth. John Ruddy (Norwich City) wins a free kick in the defensive half. Foul by Robert Huth (Leicester City). Corner, Leicester City. Conceded by Dieumerci Mbokani. Substitution, Leicester City. Leonardo Ulloa replaces Shinji Okazaki. Corner, Leicester City. Conceded by Robbie Brady. Goal! Norwich City 1, Leicester City 2. Dieumerci Mbokani (Norwich City) right footed shot from very close range to the bottom right corner. Assisted by Jonny Howson with a cross following a corner. Attempt blocked. Russell Martin (Norwich City) header from the left side of the six yard box is blocked. Assisted by Robbie Brady with a cross. Corner, Norwich City. Conceded by Yohan Benalouane.